Sharing St. Cecilia's School Community Garden: Actually...One Last Hurrah Before Winter! Actually...One Last Hurrah Before Winter! I had thought our school gardens were done for the 2017 season, however another St Cecilia parent (thank you Machelle Giovagnoli!) offered us garlic bulbs and rapini seeds. I didn't know that both of these could be planted in the fall and then will start coming up in spring. So we got a couple of classes together to do one final planting today. 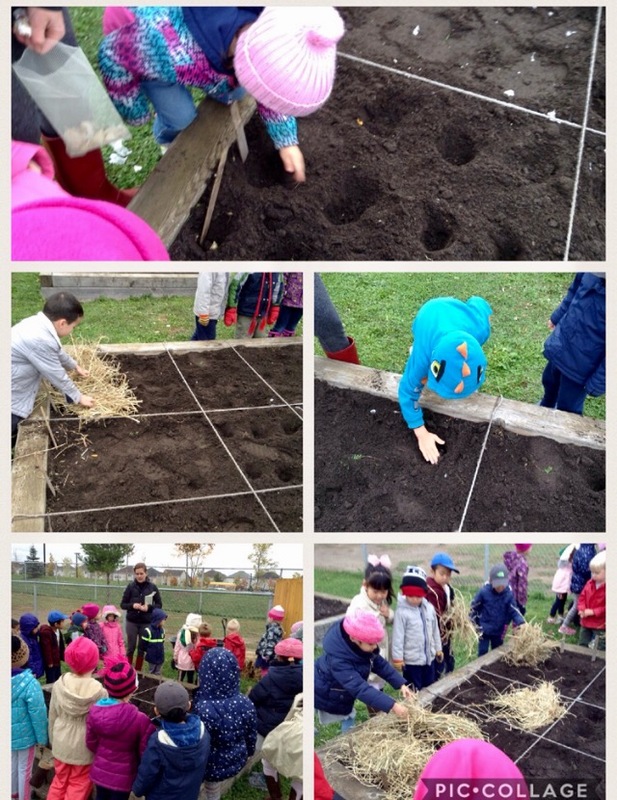 We learned that garlic likes to be covered with hay as it rests for the winter but that the greens will start to push up in the spring. We may even get lucky and have some garlic ready before school is out in June! Rapini is quite interesting - it is a seed but likes to be planted in fall. It may start to sprout before the first fall - but then gets covered with snow and will apparently keep going in the spring. If all goes well, we'll be able to harvest the rapini before planting the next set of crops in the spring. Now that is truly a wrap for the 2017 season...see you in the Spring!